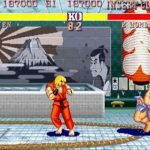 My arcade experiences started out in a Pizza Hut and shopping malls. I still remember exactly where certain arcade machines were located in the Pizza Hut game room that is unfortunately no longer there today. I loved the smell of pizza while playing some of my favorite games. 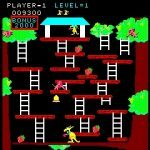 Below are the “Top and Bottom 5 Arcade Games” that I’ve played during my childhood. Some were awesome. Some were frustrating. Some took way too many of my quarters. This game amazed me so much. There was a standard/upright cabinet version but the version that I was introduced to was the larger environmental/cockput cabinet. 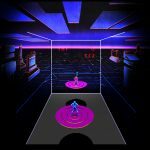 You stepped into this cabinet and it has surround sound and you feel like you’ve stepped into the Grid. 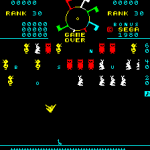 The gameplay was unique as well as the controls. Plus I LOVED the Tron movie. I put this game up here mostly for nostalgic reasons. This game was in the Pizza Hut arcade in Jacksboro, TX and I played it a LOT. The graphics were colorful, the music was catchy and the gameplay was simple yet challenging. I never got past the 2nd level but that way ok for me. The little cavemen and lizards were funny enough. 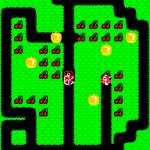 A silly game of a dude in his pajamas and nightcap doing around digging and collecting cherries. It was weird but the gameplay and music was catchy enough for me to come back to this game time and time again. This game defined by arcade playing childhood. It was 4-Players that could play together at the same time! Plus the game looked like the cartoon! The graphics. The sounds! The voices! It was so much fun! 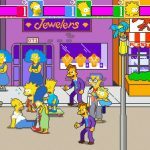 It was THE reason why when I built my own arcade cabinet, I made sure that I had 4 player controls so that I could play this game again with my friends! 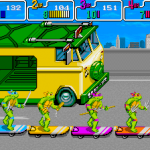 Why I loved this game is for all the same reasons as to why I loved the TMNT game. 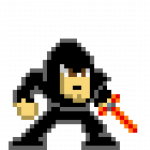 Plus the fact that you could “combine” powers with the other players to do some cool combo moves! enough to make a go at competing against other gamers. Boring solo “Pong” game. 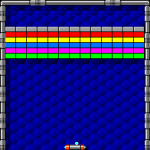 Sure Arkanoid added “shooting” into the mix but it still bored me. A mommy kangaroo hopping around and punching monkeys to rescue her baby. 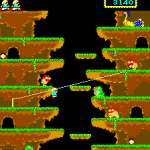 Climbing up from level to level gameplay. Boring. “BEWARE I LIVE!” and “RUN! RUN! COWARD!” That voice echoes in my head to this very day. While the game was a cool concept and had decent graphics, it was too difficult for me as a kid. 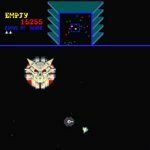 Sinistar just ate every single one of my spaceships. A video game of a bunch of carnival games? I don’t win any physical prize for these? Why bother? Lame gameplay and graphics.